Waterline Installation | Sea Engineering, Inc.
Sea Engineering performed all diving services of a 6000 foot long 30-in. diameter HDPE waterline in Pearl Harbor. The pipe was directional-drilled from two shores, with a 30 foot long spool piece between two runs. Sea Engineering, Inc. divers measured the needed lengths for make up and installed the spool piece working off our dive vessel. Our work also included installation of articulated block mats of exposed pipe. 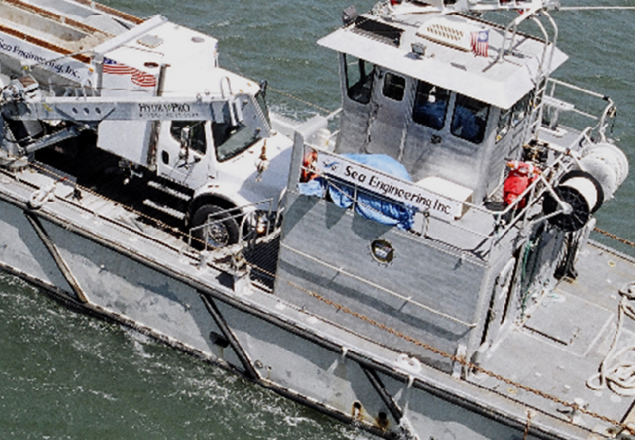 Concrete jackets for underwater flanged joints were formed underwater, and two tremie pours were made with Sea Engineering, Inc’s volumetric mixer mounted on the work vessel Huki Pau.